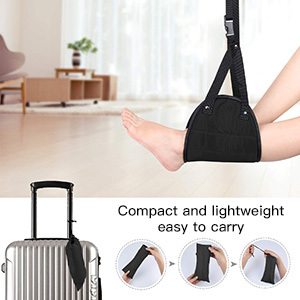 This airplane footrest use three nails and two straps to form a triangle,more sturdy and durables.We have lengthened the staps length extra 25.6 inch for the customers' advice, and we also added a lock to reinforce the strap. 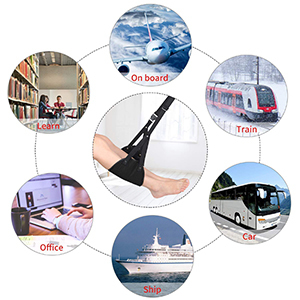 Any time any where-can be use in office, School, bus, train, long-distance airway. With it, you can release your feet, This foot rest makes a wonderful gift for the Travelers in your life! This space-saving designed easily fits into your carry-on luggage or favorite flight travel bag. Includes a handy drawstring carry bag. Simply hang it on the arms of the tray table and place your feet in footrest. Enjoy it with the tray table up or down. The reinforced straps are easy, allowing you to find the ideal length. Perfect for shorter legs.